I just came across this gem a week or so ago. I think they need our help - there aren't many days left and they are not very near that goal they've set. I'd still really love to find some time to "knitta" something about town. Can I use that as a verb? I'm now leaning toward my mailbox, just for starters. I'll see where the summer takes me. I plan no (at least little) work and all play, but I have a 4 and 6 year old that probably don't think knitting is much fun to play. This seriously might be my new favorite image ever - I wish I could see it in person. 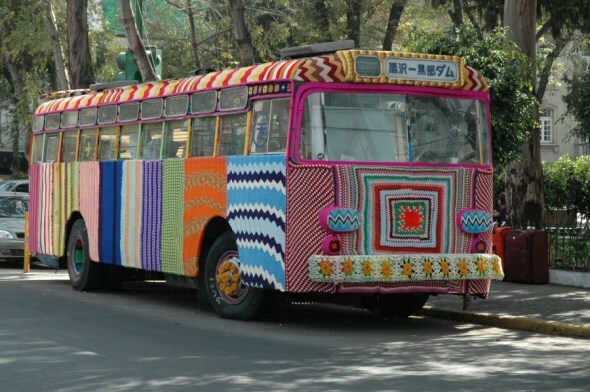 The image is courtesy of this rad blog with a ton of other fun images (ideas) so check it out if you need some yarn bombing motivators. If you are wanting to donate money to an amazing independent film visit the Yarn Graffiti Documentary donation page. Every little bit helps!